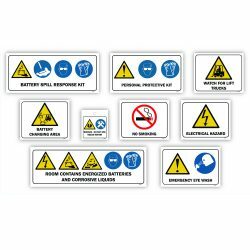 Improve safety, notify personnel of hidden dangers, and prevent accidents in the workplace with the BHS Signage and Posting Kit (SP-1), which contains nine signs for display in the battery room. SP-1 also helps to clearly identify the location of emergency equipment for quick response. This kit is also available in Spanish.